Last weekend, I was lucky enough to be invited to the Leeds City Girls event by two beaut bloggers Lorna and Holly-Lucy who together are The City Girls. Following their ever so successful first blogging event in Sheffield, the girls headed west and came to Leeds and boy we were treated to a day of cocktails, cupcakes and goodies! I met up with my lovely friend Jo, who I hadn't seen for quite a few years so we had lots of catching up to do, in Trinity and headed over to the event together. The City Girls event was held in The Liquorist on Greek Street that was once The Living Room. I passed it the other week and was in awe at how amazing it looked and believe me it didn't disappoint. As we arrived there was lots of bloggers already outside and me and Jo headed in. Of course we went straight to the bar and ummed and ahhed whether or not it was okay to purchase alcohol when it hadn't even hit lunchtime yet. As they say its always 5 oclock somewhere (or something along those lines?). The Liquorist offers an extensive cocktail list and after perusing the menu I opted for a large glass of white. All the girls mingled downstairs together for a while, chatted and popped on a name badge. Lorna then came down and we all headed upstairs for a brief introduction from the girls, what the day entailed, their vision and what brands were present. Their passion for blogging and bringing brands and bloggers together really shone through and really did reignite my love and passion for blogging and the community. Afterwards, Suzie from Leeds Womens Aid the supporting charity of the day, told us a little about the charity and that it aims to protect and support women in Leeds who have been domestically abused, an extremely worthwhile cause that had us all digging into our purses and pockets to purchase raffle tickets. We managed to raise £240 that was then matched by Aviva so in total £480 for Leeds Womens Aid on the day which is incredible! We were then let loose and free to roam the room by ourselves. Lots of stalls were set out and goodies that we could take as we went around, as well as brands to chat to. Brands on the day included Voss water, Manuka Doctor, Kendelle, Angelica Nails, The Body Shop, Bubbleology, Nails by Ivy, Benefit, Virtue Drinks and many many more. As a huge Benefit fan, this was my first port of call and they were showcasing the new They're real colour mascaras and push up liners. Even though I already had a full face of make up, Melissa tried the brown mascara and the blue push up liner on me which I loved. Subtle but natural and complimented my face. Nearing to the end of the event and after one too many glasses of wine (hiccup!) we were treated to the most delicious tray of brownie goodness from Brown and Blond. I opted for a peanut butter one and boy it was incredible! I just want to end this post by saying such a huge thank you to Lorna and Holly-Lucy who organised the most perfect event. Everything from the venue, the goodies, to the bloggers that were invited just made for such a wonderful event. One that I feel ever so lucky to have been invited to! Well done ladies! To the girls that I met on the day, thank you for your chats and smiley faces. It was lovely meeting you all! You can find a full list of all the lovelies in attendance here. 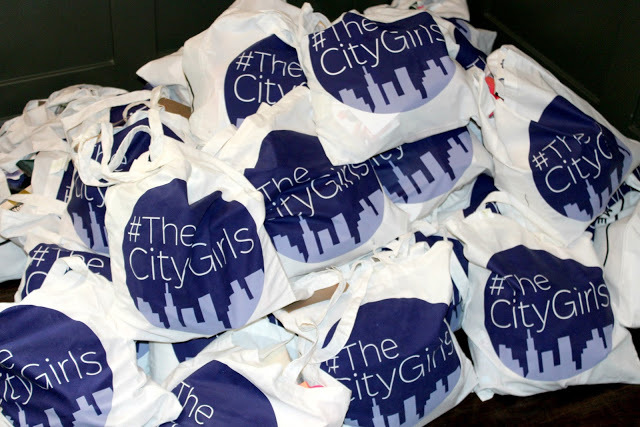 Ensure you check out #TheCityGirls hashtag out on both instagram and twitter as we managed to get trending in Leeds! The power of bloggers hey! So if you ever get the opportunity to attend a City Girls event, jump at the chance! This looks like such an amazing event. I can't wait to attend a blogger day like this! This was such a good event wasn't it? I think they've chosen to work with some really great brands and I'm so glad I got to attend!